Another bookstore in Moscow, which is most commonly described with the adjective “huge”. Moskovskii Dom Knigi (Moscow House of Books) ranks among the city’s favorite bookstores and it also has an extensive English literature section, which can be found on the second floor. It is mostly focused on contemporary fiction and classics. The English selection of this store is thus not limited in size, but as it’s true for most of these huge bookstore institutions, it’s a bit limited in scope. You can also find maps and Lonely Planet guides in English. Besides books, Dom Knigi also offers an audio and video section, postcards, a gift shop, some parts of the store are rented to other enterprises. Dom Knigi has several branches in Moscow and it even has one store in St. Petersburg, however, we only decided to list the central store in Moscow on Novyj Arbat, since it offers the widest selection of English books. You can find the list of their remaining stores on their website, unfortunately, it’s only available in Russian. 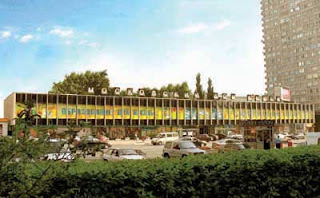 The store celebrated its 40th anniversary this year and is housed in a building which gives you a very good idea of typical soviet architecture.